Although space is more important than ever to our collective future, the coverage of space-related events in the “mainstream’ media has been dramatically reduced. Information may be available for “free” on the Internet, but it can be hard to find, and the information that you do find is sometimes unreliable. NSS can help you stay informed about space! 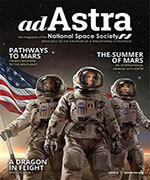 Ad Astra magazine As a NSS member you receive Ad Astra, the flagship publication of NSS. 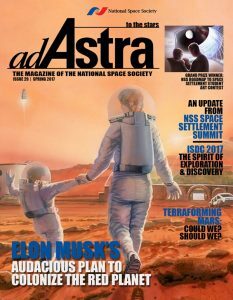 Available both on-line and in print, Ad Astra takes an in depth look at topics that you normally won’t see articles about elsewhere, and helps you to stay informed about NSS activities. Downlink newsletter Published every two weeks, Ad Astra Downlink is an electronic newsletter that all NSS members receive. Topics include upcoming events, political action related alerts, chapter activities, and space news shorts. 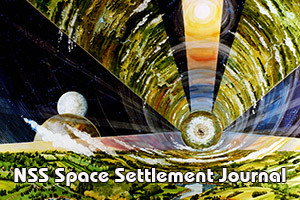 NSS Space Settlement Journal The NSS Space Settlement Journal publishes scholarly peer-reviewed articles on space development and settlement. 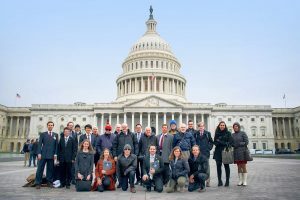 Political Action Network By joining the NSS Political Action Network (PAN) you can receive alerts informing you of critical space related events and how to educate Congress. If you want to help more, you can participate in our Congressional blitzes both in Washington DC and in your home district. 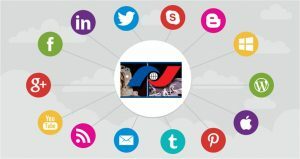 Facebook, Twitter, YouTube, LinkedIn Follow NSS on a variety of social media. Blog The NSS blog contains all NSS press releases and book reviews, as well as timely articles on space exploration, development, and settlement. 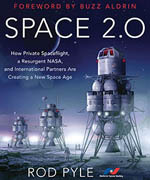 Book Reviews Over 350 book reviews on space exploration, development, and settlement, reviewed by NSS members. 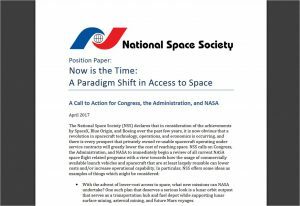 Position Papers Reading NSS position papers is a great way to learn more about topical space issues and gain perspective on how they relate to the development and settlement of space. Numerous local programs A great way to learn more about space is to attend local NSS chapter meetings and events. 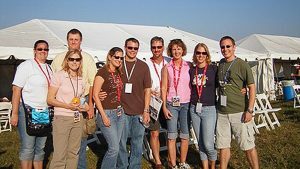 The picture at left shows members of the Florida Space Coast chapter.